It should not be confused with the American blueberries (Vaccinium corymbosum and Vaccinium angustifolium), which are the other species within the same genus. Bilberry is found in mountain regions of Europe, whole northern Asia, Siberia, Caucasus, Greenland, Western Canada, and the Western United States. The bilberry plant is a small shrub, bearing edible berries. Bilberries are usually coated with a thin blush wax layer protecting berries from moisture and drying out and gives them a dull, light blue colour. Some berries, however, lack the gene and are therefore bright and dark blue. The berry contains fruit acids, flavonoids and polyphenols (natural antioxidants), tannins, C vitamin, glycosides and sugar. The bilberry fruit is commonly used to make juices, jams and dishes. The famous one is the bilberry pie (Finnish: mustikkapiirakka, Swedish blåbärspaj). They are eaten fresh or used as ice-cream toppings. Bilberry, the super fruit of Arctic contains the most powerful antioxidants - anthocyanin. Bilberry has the anthocyanin content of 558 mg per 100 g of berries. Bilberries have the highest cellular antioxidant activity of the 25 fruits tested, as well as the highest total phenolic content and oxygen radical absorbance capacity (ORAC) according to a study conducted at the Cornell University (1). Bilberry (Vaccinium myrtillus) has been used as a medicinal plant for thousands of years in traditional medicine all over the world. Bilberry leaf is used for different conditions, including diabetes type II, as a diuretic and astringent. Berry powder made of dried bilberries is traditionally used to treat diarrhoea. Herbal supplements containing bilberry and / or blueberries are on the market, used for circulatory problems and for vision improvement. 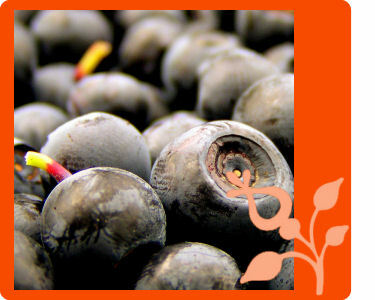 Bilberry fruit extract is important source of antioxidants for cosmetic and beauty products. The benefits of antioxidants come from their ability to minimize the oxidative damages caused by free radicals, UV-light and environmental pollutants. Bilberry Shampoo containing antioxidants and protective berry wax was produced by Ecouna AB (Swedish company producing natural cosmetics that contains extracts of arctic berries and herbs). Bilberry seed oil is rich in omega-3 essential fatty acids, natural antioxidants tocopherols, carotenoids and the vitamin E compounds that efficiently protect the body. This unique combination of actives makes bilberry seed oil a unique ingredient for anti-ageing purposes and for protecting, hydrating, nourishing skin, body and hair. Bilberry is economic important as source of raw materials (tannin/dyestuff), food additives (colouring), beverage base, fruit. Food and Agriculture Organization of the United Nations has bilberry in the database under ecocrop code 10714. Can the wild blueberry (Vaccinium myrtillus L.) be tamed?